Marisa Silver’s Permanent Record is a great movie, and it does what few dramas seem to do today: it plays it straight and honest. You know what I mean — recent theatrical dramas always seem to feature some ludicrous star turn or credibility-straining plot contrivance that the “experts” feel are necessary to make the film “marketable” to movie theater “audiences.” Really good, non-ironic drama is becoming the sole purview of cable television. It seems that straight drama can only make it into movie theatres with big stars under pounds of heavy makeup, or with the umpteenth regurgitation of a popular formula, or with the two deeply disturbed protagonists improbably entering a dance contest. A good story, well told. Is that not enough anymore? THE PLOT IN BRIEF: David (Alan Boyce) is a high school student who seems to have the world on a string. One night while partying with his friends on a big bluff on the outskirts of town, David falls to his death. Everyone assumes it is an accident until a few days later, when David’s friend, Chris (Keanu Reeves) receives David’s suicide note in the mail. The suicide devastates David’s friends, family, school, and community. The rest of the film chronicles their grief and their inability to understand why David killed himself. I am not the biggest Keanu Reeves fan (I tend to agree with the critic who wrote about Reeves’ turn in a stage play of Hamlet: “The most charitable thing I can say about Mr. Reeves in the title role is that he said all the words in the right order.”) Still, I think this is his best movie. And YES, I have seen Point Break and Speed. 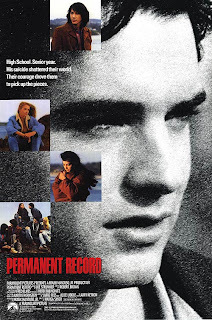 Most of the praise and superlatives I lave on Permanent Record (and Reeves), other critics shower on River’s Edge, Tim Hunter’s 1986 teen drama. There is a lot to like about River’s Edge, but I am afraid that the over-the-top performances of Crispin Glover and Dennis Hopper spoil that film for me. Make no mistake — Keanu Reeves is very good in River’s Edge — but he is even better in Permanent Record. River’s Edge received most of the acclaim; it won Best Picture at the Independent Spirit Awards. Permanent Record is now largely forgotten, and it would be a shame if that was because it lacks a big “bull-goose loony” star performance or some other sort of “marketable” gimmick. I am getting rather tired of big “bull-goose loony” star performances. Most of the music in Permanent Record was written and performed by Joe Strummer, and that is another reason that I recommend this film. His work with The Clash is beyond iconic, but his latter film work is interesting too. He wrote “Love Kills” for Sid and Nancy, scored Grosse Pointe Blank, and recorded five tracks for Permanent Record with his band Latino Rockabilly War. The film also makes a very poignant use of a J.D. Souther song. I have written before about how few Hollywood films get high school “right.” Arthur Hiller’s Teachers (1984) gets high school right. Allan Moyle’s Pump Up the Volume (1990) gets high school right. Permanent Record is one of the most realistic portrayals of an American high school in any film; this film gets it really right. I also give this film massive credit for being comfortable with ambiguity, which is becoming another rare commodity in modern films. No one in the film knows why David did it; several theories are proposed but not one of them is shown to be right. Yet the film is not abandoning its artistic responsibility — far from it. 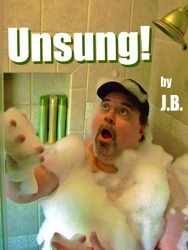 The film acknowledges that some things are unknowable. This drives some viewers crazy, but this film is not concerned with Hollywood’s usual tidy bromides. Its ambiguity is intentional: the film explores how its characters reconcile themselves to the role ambiguity can play in human experience. When Keanu Reeves’s character steps away from the fence at the very end of the film, we see just how much he has grown as a person and how, in a very real way, he has reconciled himself with the tragedy. Permanent Record is available on DVD and Amazon Instant Video. So there is no excuse not to see it! Let me know what you think. Thank you for writing this and for everything you say about it. I watched this movie SO MANY times in the late '80s and it has always meant a lot to me. After reading the column, I was compelled to find the video of Jennifer Rubin (girlfriend of both Doug and Adam Riske) singing at the school play. Just watching that clip was enough to make me cry. And I've always loved that last shot. Thank you thank you.